We have carried out extensive commercial flooring projects for the Canary Wharf group. On receipt of a project / tender you will be assigned a Contract Manager, who will be your direct contact from the start to the finish of the project, They will arrange a site meeting with you and arrange an estimate and programme of works tailored to the requirements of the contract. 1. Full site survey including sub floor investigation. After your initial enquiry we will arrange a site visit to check the existing surface and sub floor in order to be able to recommend the best way forward. 2. Floor preparation and product specification recommendation. From our investigations during the site visit we will recommend the most appropriate and durable flooring products for your project. 3. Costing and estimate. Once the products have been identified and the area has been measured, a written estimate is produced. This includes a full job specification and making provision for sub floor preparation, supplying and laying the flooring material. We will make recommendations for finishing details of the floors and any ongoing maintenance. 4. Risk Assessment, Method Statement and COSHH. A Risk Assessment for each project is prepared with Method Statement and COSHH (Control of Substances Hazardous to Health). Health and Safety precautions are always followed to safeguard both you and our employees. 5. Installation and full Contract Management service, including Quality Management. 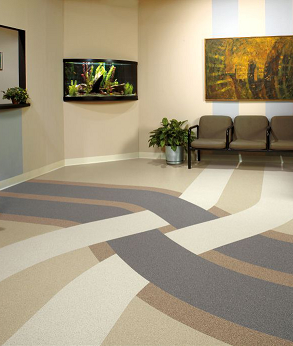 As valued commercial flooring contractors we will always keep you up to date with progress during the project. Once installation is finished, we will remove old and excess flooring material from the site, including any environmentally hazardous waste, and dispose of it appropriately, leaving the site clean and tidy. We will also send you a Quality Control form to help us improve our service.